For a successful holiday at the edge of the Arcachon basin, our 4-star campsite La Forge welcomes you for a stay with family or friends. Throughout the year, we offer comfortable accommodation and many services to make you spend unforgettable moments. 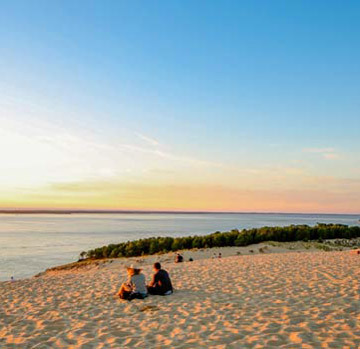 Located in a forest area of 19 hectares, our campsite is easily accessible from Arcachon (13km), Bordeaux and its airport (55km) and the station Teste (7km). Throughout your stay, our teams are at your disposal to inform you and make your stay enjoyable. Thanks to many services within our campsite (aquatic area, sports activities, laundry, bar, wellness area …), the desires of each will be filled. Feel free to book among our different comfortable accommodations and perfectly equipped for a weekend or for a whole week. We guarantee a relaxing holiday with all your family in the heart of a beautiful natural setting. Reception is open 7 days a week from 9:00am to 7:00pm non-stop. The booking service is open from Monday to Saturday from 9:00am to 6:30pm. Reception is open Monday to Saturday, from 9:00am to 12 noon and from 2:00pm to 6:00pm. It is closed on Sundays. The booking service is open from Monday to Saturday from 9:00am to 6:30pm non-stop.